Humans plan their speech ahead of time, but can animals do the same? What happens when an animal is ready to vocalize, but gets interrupted? We will examine whether meerkats prepare for calling, and whether they ever change their minds about it at the very last moment. We hypothesize that changes in breathing patterns can be used to detect and measure call intention. Showing these phenomena in animals would suggest that animal calls are highly intentional and are under complex cognitive control. Humans are known to plan their speech in terms of what they want to say and how long they want to speak. An intention to talk can be detected by noticing the changes in breathing, as air has to be inhaled before speaking. In addition, the depth of inhale correlates with the duration of subsequent speech, meaning that we prepare our vocal apparatus both for the initiation and for the duration of speaking. So theoretically, by monitoring breathing we can identify when a person wants to talk even if eventually they change their mind. It is however not clear if animal calls have the same level of intentionality and control. Can animals plan ahead when and for how long they intend to call, and sometimes even change their minds about it? Or are animal calls just simple instinctive responses? The evolutionary link between human language and animal vocal communication have been extensively studied. However the question of consciousness and intention behind animal calls remains unanswered. This project will tap into the decision-making processes behind animal vocal communication. Our prediction is that similarly to humans, animals plan ahead and prepare for their calls. Their decisions are flexible and affected in real time by received signals and changes in the social environment. This project will result in a novel method for measuring animals` intention and motivation to produce a call. Being able to predict calling behavior before it actually occurs will give us a powerful new tool for understanding the flexibility and complexity of animal communication. We will observe meerkats in their natural habitat in South Africa during their morning vocal interactions. We will record their calls and film their faces using thermal cameras. 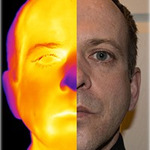 From the thermal videos we will extract temperature values from the nasal area of the individual animals. From these temperature values, we will generate a simulated breathing curve (inhaled air cools the nostrils and exhaled air warms them). We will synchronize the breathing curve with call times and look for characteristic breathing patterns that consistently precede calling. Using these patterns we aim to predict when meerkat is preparing to make a call. We will also examine if those breathing patterns can be further classified to predict the duration of the subsequent calling. As this is a pilot project it does not qualify for direct institutional funding. So in order to get to the field station, stay there for the duration of data collection, commute within the reserve and cover the costs of petrol we require additional resources. The money will not be used as salary or any other kind of personal payment as all team members are externally funded. 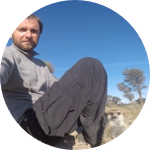 The research site in South Africa is unique as it allows access to habituated and marked meerkats in their habitat, allowing us to observe and record behavior in a natural context. Conducting this project in captivity would likely introduce biases related to the animals being detached from their relevant ecological and social context. This crucial introductory stage will allow us to assess the feasibility of using breathing patterns for predicting intentions to call. It will pave the way for future research focusing on how complex social environments affect individuals` decisions to produce or withhold calls. This is a novel idea taking advantage of new technologies to answer very important questions in animal communication. The proposed approach will open up many opportunities for future studies. The researcher is a very talented and innovative scientist. This project is highly innovative. Peering into the minds of animals in their natural world is the next frontier of field biology. The combination of thermal video analysis in the hands of an animal communication expert will produce novel results. I fully endorse this project. Two months at the KRC will be devoted to collecting audio and thermal video of meerkats. Field updates will be posted online. A long collection effort is required, as the window for daily recordings (while meerkats are sunning) is short. An additional 1.5 months will be dedicated to data processing, annotation and generation of breathing curves from the thermal images. One more month will be spent identifying breathing patterns that precede calling and summarizing the results for publication. Collection of acoustic recordings and synchronized thermal video in the KRC, South Africa. Regular field updates will be posted as lab notes, photos and videos. Live video chat with project backers. A short video walk through the camp (dependent on the quality of internet connection). Data processing and preparation for formal analysis (University of Konstanz, Germany). Brief summary of collected data will be posted as lab note. Generation of breathing curves from thermal data and synchronization with vocalization events. A personal thank you notes and original , high quality meerkat photos taken at the research site will be e-mailed to project backers. A video conference with project backers. Summary of the project, explanation of the results. Q&amp;A session. I am a Behavioral Ecologist specializing in acoustic communication of social mammals. I have been conducting field based research for 8 years, studying the complex dynamics of vocal communication within animal groups in natural and behaviorally relevant context. I am especially intrigued by the social effects on communication: how the presence of other individuals affects signaling tactics, and how animals decide when and which signals to emit.